Why do people consistently want to watch old movies? Old movies had substance. Their themes were often universal as was their appeal. There was generally a lot of meat on the bones for the audience to digest. Old Movies had great actors. These were people who had staying power in the business and were not like today’s flash in the pan “movie stars” who become unknown after a season. Most were household names. Old movies were often shot in black and white (even after the introduction of color film) to make use of dramatic lighting and shadows. Think of Bela Lugosi’s face in Dracula, Jane Darwell’s in The Grapes of Wrath or many of Alfred Hitchcock’s films. These employed imaginative lighting that brought the characters and emotions to life. Old movies were often film adaptations of proven great books. Again, I cite The Grapes of Wrath among many others. Unlike today, the film adaptations were just that: Adaptations of great books and not off topic creation by hack screen writers. Old movies had less gratuitous violence and often incorporated more family values as compared to modern films. They did not offend the senses. Today, movies aren’t even considered “good” unless scores of people are killed in 120 minutes. Old movies used many “real people” extras as opposed to today’s digitally mass-produced crowds. The term “with a cast of thousands” was once a reality that gave a film greater texture. Real people really do look more genuine than the foley edited variety. Consider The Ten Commandments. Old movies used fewer special effects and relied more on real effects. This created more reality although it did also include some danger for the actors involved. My father, for instance, was pulled into a wall by a large spring after his character was shot in the film The Outlaw. Old movies developed characters in greater depth and that in turn allowed more viewers to identify with individual characters and the actors who portrayed them. Everyone knew Rick from Casablanca, right? Old movies were each unique. That is to say, there was no Casablanca 2, 3, 4, etc. Serialization was reserved for the serial shorts that played in theaters before the main attraction. Features were actually featured. Old movies had richer sound tracks (not better ones). Today’s sound tracks are certainly of a better audio quality but lack the contributions of the studio orchestras that were behind the scenes of old movies. I’m thinking here of the Swan Theme from Swan Lake in Dracula and many others that used rich orchestration. Old movies dealt with real life current events realistically. Yes, today’s films do sometimes portray current events but usually not the urgent and realistic manner that old movies did. Consider 1942’s To Be Or Not To Be. The balance between humor and tragedy is perfect in portraying very real current events. 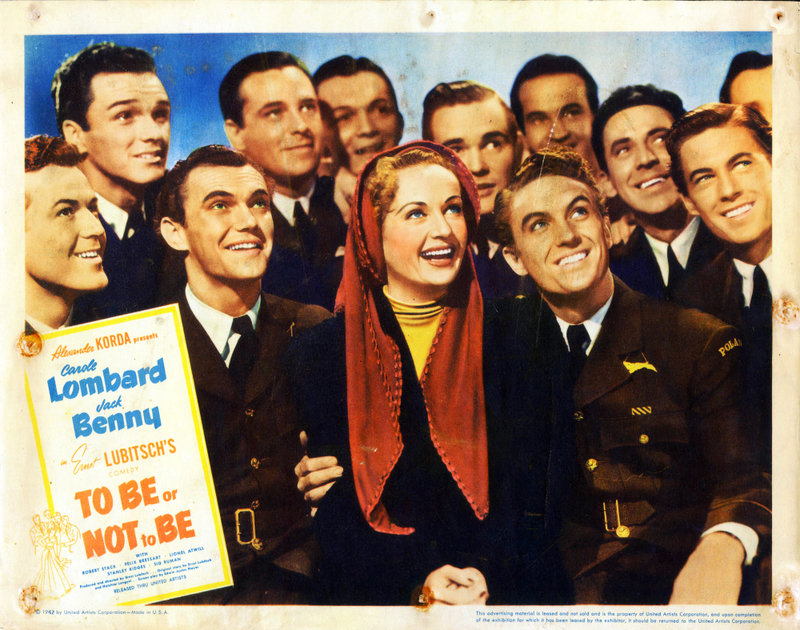 That’s my father Gene Rizzi behind Carole Lombard in the movie poster above. Lastly – Old movies made you cry and laugh out loud. Emotions were not hidden or drowned out under a barrage of Dolby and theater advertisements for local car dealers. When you saw an old movie, you were generally moved one way or the other. That’s why so many of us have a large collection of old movies on DVD or Blue-ray. These are my observations along with those of some of my friends and colleagues. Do you have any you would like to share here? Please comment. * Note: While The Grapes of Wrath was shot in black and white, the above theater movie poster was printed in color. 70’s childhood we often can not believe how different (not in a good way) they are from today’s movies. Although the amount of violence and hard to hear people over the music is not something I’m a fan of. Thanks for your thoughts. Take a look at some of films I mentioned if you haven’t seen them. Enjoy! One of my favorites is “Lost Horizon,” with Ronald Coleman, Thomas Mitchell, and other great studio actors. It might be considered a bit hokey today, but its theme and message will live forever. I love Lost Horizon as well. Great movie! Allen, have always been my favorite- perhaps due in part to all the fine character actors. Excellent post! Thank you. I am also partial to old movies because my father was an actor. My pleasure, Allen. That’s marvelous!